Many developers and contractors are incorporating stone into their projects as it has become the standard for new builds. Marble is one of the top sellers in the natural stone market. As the warmer-toned Adalia Cappuccino and the softer Crema River tiles tend to be the standard neutral marble preferences, designers have begun to shop outside what could now be considered the traditional marble selections. Bianco Dolomiti is another type of marble that is considered a higher quality than the traditional building material. This natural stone has a straight edged polished finish. Its masculine grayish-white color displays a swift brush-like finish giving it a sleek, yet edgy look. It has a creamy white background that softens the surface enough to give it a hint of gleam. What is Bianco Dolomiti Made From? Bianco Dolomiti is a premium grade of marble. Marble is primarily made of travertine—a grayish, beige-like natural stone that forms near hot springs and caves. If travertine gets embedded deep enough in the earth, it becomes susceptible to a metamorphic process caused by extreme blistering temperatures and compression. These two catalyst cause the natural travertine tile as well as any other natural stone or fossils that are in close proximity to actually melt together and reform into the polished marble we recognized today. What makes Bianco Dolomiti such an interesting grade of marble is that normally, through this metamorphic process, the spectrum of colors tends to be quite broad. For marble to recrystallize in a predominately white color is extraordinary which is why it is considered an exclusive grade. Where is Bianco Dolomiti Mostly Used? You will most likely find Bianco Dolomiti in high-end boutiques, and in lobbies of premier hotels and bathrooms. Its masculine sleek dark veining makes a striking décor for walls. Installing it as part of your flooring creates a modern yet majestic space. Bianco Dolomiti can also be used for countertops, vanities, decorative bar tops and shelving. Marble is a waterproof, but it needs to be treated accordingly. You won’t ever have to worry about water leaking through marble, but it is porous enough to catch a stain. That is why a sealant is needed to treat any kind of marble on a 12 – 16 month basis, depending on how often the surface is utilized. Marble has a smooth and glossy finish, but if it’s not treated properly, that gloss can and will fade over a period of time, creating a matte-like finish. This matte finishing is developed through the use of wear and tear. Marble flooring is especially susceptible to this. It’s like sandpapering a smooth surface. A good sealant prevents a smooth surface like marble from becoming scuffed. Purchasing a sealing protector like the 511 Penetrating Sealing Impregnator for your polished Bianco Dolomiti. It forms an invisible barrier between the shiny surface and passive-punishing conditions. The clear coating won’t alter the marble’s natural look. It is easy to use, safe for food areas, weather resistant and U.V. transparent. The 511 Penetrating Sealing Impregnator covers approximately 1,000 – 4,000 square feet per gallon and is offered in a pint, quart, gallon, or pail ranging from $20 – $588. Bianco Dolomiti is considered the top choice for high-end building projects. That’s why builders and contractors need to buy this material at the best price possible. Unfortunately, because Bianco Dolomiti its such posh preference for most refined projects, the ‘best’ price can start twice as high as traditional marble tile. To get the best price for Bianco Dolomiti means buying your inventory in bulk. 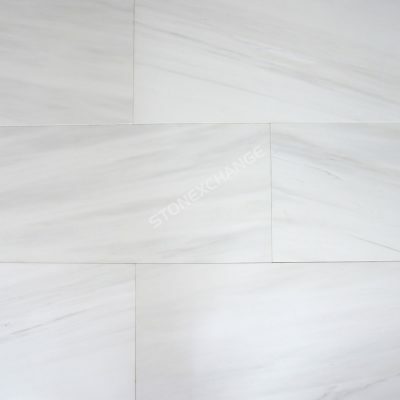 That means finding a natural marble tile wholesale distributor who offers an abundant supply of Bianco Dolomiti. Furthermore, you want to make sure that they offer you a discount if you order in bulk. Not all wholesale distributors will offer their customers a discount if they order in bulk. So be sure to shop around for one that does. It is also wise to take into consideration your wholesaler’s delivery regulations. Be sure to inquire if they deliver anywhere in the United States. Nalboor Tiles, a natural stone distributor, is located in Miami, Florida. This is most advantageous for local builders and contractors—and those all over the country! Most builders and contactors make the mistake of finding a natural stone supplier nearby thinking that they can reduce the delivery costs. However, what some might not take into consideration is that some job sites might be located out of town. So maybe the up-front cost might be a little cheaper, but when it comes to shipping and handling, the back end costs could end up being as much, if not more than the competitor! To qualify for the lowest price possible, Nalboor requires the minimum order to be one full crate. With Nalboor, you can also order a free sample of Bianco Dolomiti online as well as place an order or ask a question. Inquire about a wholesale quote here. If you would like to speak with one of our representatives, call 1 305-501-4548 today!